The Deanship of Student Affairs at Al Falah University in the presence of the University President Prof. Abdelhafid Belarbi and the Vice President for Academic Affairs Dr. Sameer Barghouthi announced the results of the student council election for the Academic Year 2018-2019. 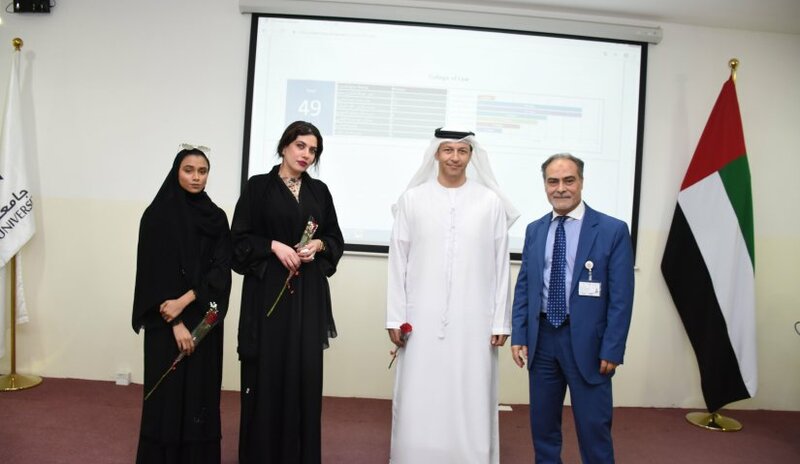 Prof. Belarbi declared Massoud Ali, Ahmed Badawi, Hamda Ali from the College of Mass Communication, Shaima Jabara, Hamad Lanjawi, and Mira Al-Muhairi of the College of Law, and Mena Nuri from the College of Business Administration as the elected students. The Student Council seeks to achieve several goals, foremost of which is to work as a link between the students and the university administration, to serve the students and raise their issues in addition to enhancing the spirit of participation, teamwork, and cooperation.